It’s very sad to see that Robin Murray has died. I remember him from my time working at the GLC between the autumn of 1984 and its closure in March 1986. He was the head of the Industry and Employment Branch of the GLC and I had been recruited to be, if I recall correctly, the Branch’s Publications Co-ordinator – a rather vague title for a job which seemed to have rather ill-defined responsibilities. It soon became apparent that this ‘Branch’ of the GLC had many different sections or groups inside, nearly all of whom had only been working there for just a year or two and most of whom were engaged in some sort of autonomous publishing activity. There were about 200 people in all, concentrated in various rooms at the southern end of the ground floor of County Hall, but with outposts further afield. Because the branch had grown so fast there was very little centralised co-ordination, and finding out who knew what was an adventure in itself. Presiding over the chaos was Robin, charm personified and with a deep interest in everything going on round him. This would drive many people bonkers, because while you would be waiting in his outer office for a scheduled meeting with him, he was inside with someone else, time overrun by an hour or more, talking about tiny points of detail. Every so often, he would chair a meeting which was supposed to co-ordinate the work of the Branch. Twenty or more people would crowd into his office, sitting around his meeting table, and we would go through what was happening in the far flung parts of his empire. Part of the work of most of the Branch’s sections was to work on a grand plan for London, given the title of the London Industrial Strategy. This had been conceived in the early days of the Labour GLC administration when Michael Ward had become chair of the Industry and Employment Committee. I am not sure of the original publishing schedule for it, but suffice it to say, it was still somewhere in the gestation stage when I arrived in 1984. 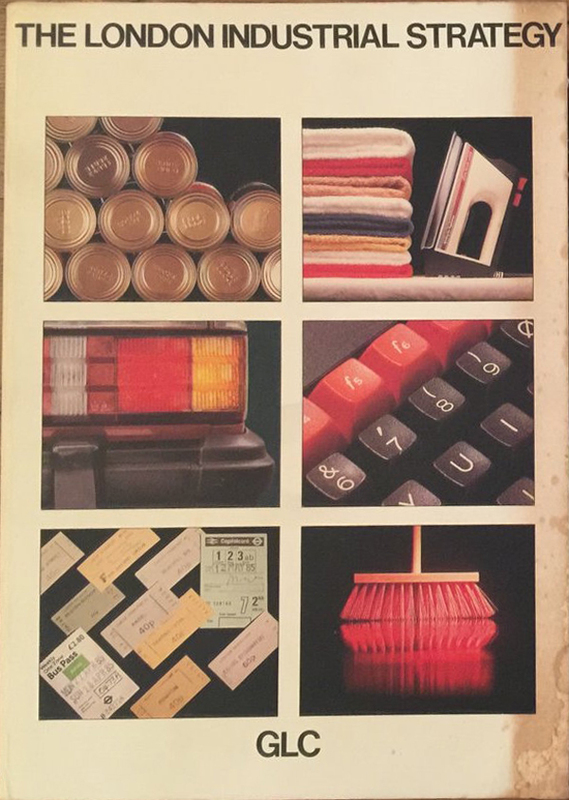 The LIS had been conceived to have something like 30 chapters, covering not only industrial sectors such as printing, food and car manufacturing but also subjects like domestic work, homeworking and cleaning. Some chapters had been drafted but many more only existed in the form of committee reports and the like. Two academics, Ben Fine and Teresa Hayter, had also been employed part-time and their job seemed to be to write up some of these sections, and compile a Ten Point Plan of Action for each. Robin was a great believer in Ten Point Plans of Action. During the year of 1985 Ben, in particular, rose to the occasion and turned out a final draft of chapter after chapter, which I could then copy-edit. We struggled on. Every so often there would be a meeting to see where we had got to. Robin loved these: they seemed more like a university tutorial as he had the chance to quiz everyone about whether they had read so-and-so’s latest version of their chapter. The typesetting and page layout was in the hands of a man called Reg, in the GLC Supplies Department. He was also handling the production of most of the other reports which were in hand. Reg had heard about the co-ordinating meetings and would often turn up for them, and it took a while to persuade him that people shouldn’t send their work straight to him without going through me. In the end, we developed a good enough relationship and he would buttonhole me in the County Hall bar if I called in for a drink at the end of the day. In the run up to Christmas 1985, with the abolition of the GLC now only just over three months away, Robin allowed us to begin typesetting the text. Making up the pages began to follow. Then he decided that the introduction would fill the first 64 pages, and that he would write precisely the number of words which would fill that space. Sometime in the early new year came another bombshell: Robin needed to take some time off. ‘Family reasons’ is all we were told. The whole project looked doomed, but in the hope that it wasn’t I carried on editing sections, choosing pictures and writing captions, and Reg persevered with the layout. By the time Robin got back to work, everything was pasted up on boards – except the first 64 pages. Never mind, he told me. The writing of the introduction was his highest priority. When was the final deadline by which he had to have it finished? The typewriter began to clack away and days would pass without me worrying him as to his progress. Inevitably he got sidelined doing other work but then with the final, final deadline coming the next day he told me in the late aftenoon that he would have the draft finished that night so that Reg could have it first thing in the morning. I waited. People went home. The bar closed. I sat in my office working on some of the other dozens of projects which were also still in hand. Finally, at about 11 or 12 in the evening, the internal phone rang and Robin asked me to go over to his office. ‘Charles, my dear old friend, come in, come in.’ The office was strewn with paper and books, but there was what looked like a pile of typescript on his table. But of course, I couldn’t just pick it up and take it away – I had to go through it with him. So we sat, side by side, with him showing me sections, asking me what I thought of them, and him making further corrections by hand as we proceeded. Hours more went by, marked by the chimes of Big Ben just across the water. Eventually, sometime around 4 in the morning, we finished and I grabbed the papers before he could decide he wanted to look at them again. ‘I need to take them up to Reg at 9am,’ I said. ‘Are you going to go home now?’ he asked. ‘Yes, that’s the plan,’ I replied. ‘I shall sleep here,’ he told me and pointed to the sleeping bag rolled up in the corner. Even only four hours in bed seemed a better idea than kipping on a cold hard County Hall floor, so I said goodnight. I had to get a bemused and grumpy security guard to unlock the front door for me. I didn’t tell him that a senior officer was sleeping on the floor just a few yards away. Reg got the typesetting done, and with a few adjustments to pictures, we managed to get everything into the first 64 pages. The job went to the printers and then, finally, the books arrived. This must have been sometime in early March. In the meantime, Neil Kinnock had agreed that he would launch the plan and speak at the event. This was held in one of the big meeting rooms in County Hall. Kinnock, I think, spoke first and then invited Robin to say something. What followed was a master class in public lecturing. Robin had some old fashioned pre-Powerpoint slides but everything else depended on his speaking style. He held the audience throughout. At one point he removed his jacket, folded it and placed it on his chair, without interrupting his flow. He would, he said, have fourteen points but some would have some subsidiary points. On he went, for perhaps 40 minutes in all, mesmerising the assembled staff and guests. When he finished, he was greeted with sustained applause. Many people hadn’t seen him since he had returned from his leave of absence, and this was a tribute to the inspiration (and devotion) with which he was regarded. Neil Kinnock, to his credit, had stayed to the end and then rose to respond. A great orator himself, he had obviously recognised that he had been present at a brilliant demonstration in how to hold an audience. He had recently been to the opera in Milan, he said, and after the finale the principal tenor came to the front of the stage and performed one of the complete arias as an encore. After the applause Robin had received, he thought that he might come forward and perform points 10 to 14 again. We were by then of course only a couple of years off the next general election and as one of Michael Ward’s staff said to me afterwards, ‘That was Robin’s application to be the Labour government’s chief economic adviser.’ History intervened, however. Two years after the GLC closed, Margaret Thatcher called an election. Neil Kinnock never got to be Prime Minister and Robin Murray never made it into the No 10 back office. Some years later, I bumped into Robin in London, I think on the Tube. He greeted me again: ‘Charles, my dear old friend, how are you and what have you been doing?’ Charming, inquisitive, inspiring to the last. I shall never forget him. UPDATE 14 September 2017: Frances Murray and Michael Ward have kindly sent me a photo which must have been taken in a basement corridor of County Hall on one of the last days of the GLC’s existence. 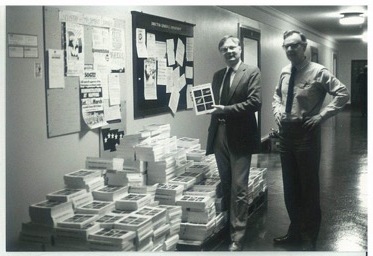 It shows (on left) Charles Foster and (right) Robin Murray with several pallets laden with the LIS’s companion volume, the London Labour Plan. The Labour Plan ran to an even tighter schedule than the LIS. The GLC’s Supplies Department was overwhelmed with work in the last few weeks of the GLC’s existence, and so we took the decision to outsource its entire design and production to an external contractor. The books were delivered loose on pallets, and many demob-happy members of the GLC staff were seen helping themselves to copies as they passed along the corridor in which they were stacked. I have no recollection of taking Robin downstairs to observe the scene, nor of the person who must have snapped the pair of us for posterity, but I am very glad that they did. Thanks to Frances and Michael for the picture.